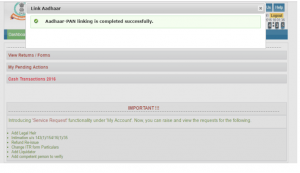 How to Link Aadhaar Number to PAN Card ? The Income Tax Department has made it easy for taxpayers to link their PAN card with Aadhaar with just a 2 step process which does not require you to login or register on the e- filing website. This facility can be used by anyone to link their Aadhaar with PAN. As per the Income Tax Department notification, income tax returns could be e-filed without linking Aadhaar and PAN till 5 August 2017. The deadline to link PAN with Aadhaar, which was initially extended from 31st August 2017 to 31st December 2017 and subsequently to 31st March 2018 followed by 30th June 2018 has now been extended to 31st March 2019. Do note that while income tax returns can be filed without linking, the tax department will not process the returns until PAN and Aadhaar are linked. 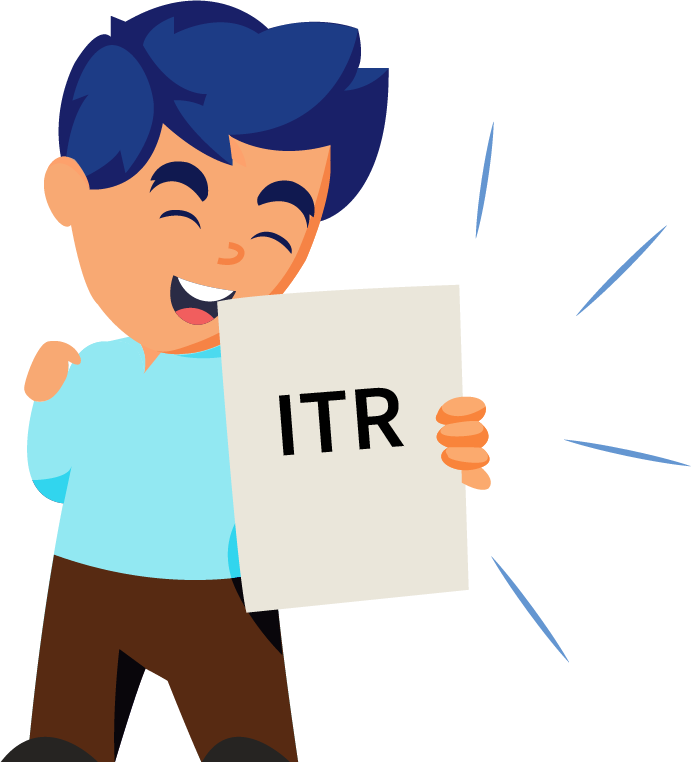 People can visit the official e-filing website of the department to link the two identities, in both the cases– identical names in the two databases or in case where there is a minor mismatch. 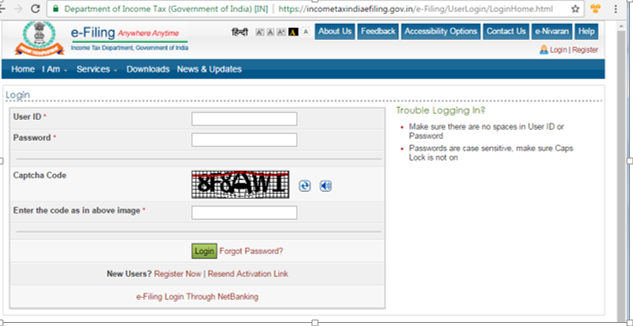 Online linking of Aadhaar number with PAN can be done by logging on to the income tax e-filing portal. There are two ways of doing it on the income tax portal. After entering the details click on submit. Post verification from UIDAI the linking will be confirmed. In case of any minor mismatch in Aadhaar name provided, Aadhaar OTP will be required. Please ensure that the date of birth and gender in PAN and Aadhaar are exactly same. In a rare case where Aadhaar name is completely different from name in PAN, then the linking will fail and taxpayer will be prompted to change the name in either Aadhaar or in PAN database. Step 1: Register yourself at the income tax e filing portal, if you are not already registered. Step 2: Log in to the e-Filing portal of the Income Tax Department by entering the login ID, password and date of birth Step 3: After logging in to the site, a pop up window will appear prompting you to link your PAN card with Aadhaar card. If you don’t see the popup, go to blue tab on the top bar named ‘Profile Settings’ and click on ‘Link Aadhaar’. Step 4: Details such as name, date of birth and gender will already be mentioned as per the details submitted at the time of registration on the e-Filing portal. Verify the details on screen with the ones mentioned on your Aadhaar card. 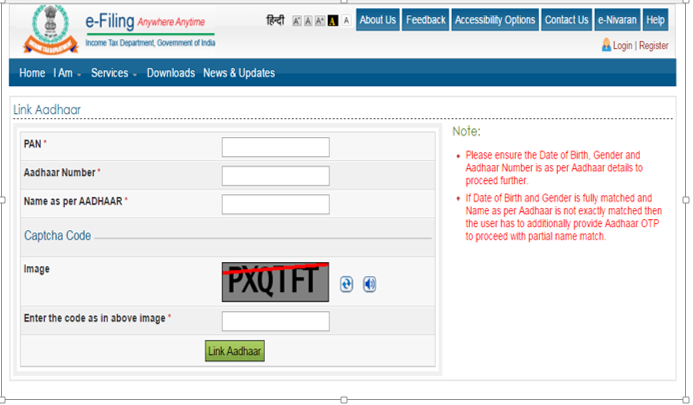 Step 5: If the details match, enter your Aadhaar number and captcha code and click on the “Link now” button. Step 6: A pop-up message will inform you that your Aadhaar number has been successfully linked to your PAN card.